They are both screw-ups, they are atheists, they do not believe in God.” “You see me,” she is said to have continued, “Give me a gun and I will fix all the problems in the world, both of them (parents) first, then their offspring. Do not tell me there is no God,” she added while noting that persons with such beliefs should keep it to themselves. The audio recording of which the teacher’s voice has been identified, as the one addressing a classroom session, has gone viral on social media, generating numerous comments both for her gun talk and jab at homosexuals. Yesterday, a senior official at the school confirmed the incident, telling Newsday that a report was being prepared to be passed to the Ministry of Education. The official said: “Yes, we have heard it and we are following the rules. We have contacted the Ministry of Education and at this time, we are in the process of preparing a report” “At this school we do not judge, (students) we do not judge at all,” the official said. “We will be delivering that report and we are treating the matter very seriously.” Up to yesterday the teacher was still in the classroom and Newsday was told that she has been receiving support from members of staff. There has also been some counselling sessions for both students and teachers as a result of the incident. According to reports, last Thursday, while conducting assembly in which there was a scripture reading, the teacher (name called) is said to have condemned homosexuality, immediately sparking debate among some of the students of the allmale college. Newsday learnt that the following day, during assembly, one student marched to the front of the hall and told students it was okay “to be gay” before walking off. There was an uproar. The female teacher who has been a member of staff, “for many years”, later admitted to being “thrashed” by other teachers for her remarks. She then met with students on Friday to explain her side of the story and it was during that session, that she made some shocking statements to the point of even identifying the student by name, who she (the teacher) said was gay and called his parents atheists. She said it is because of what he believed, the student could have gone in front of the assembly in support of gay persons. The teacher denied she ever made a pronouncement on “gay people” during assembly last Thursday, claiming that instead, all she did was read from Scriptures. “And all Scriptures and doctrines say, that to be gay is wrong. It is not something appropriate in the eyes of God. However, I also live in a cosmopolitan country whose watchwords are discipline, tolerance and production. Tolerant I can, if you want to walk with your jockey shorts on your head and leave your privates out all over the place, that is your right, your opinion, and I am tolerant to that. “So you being gay, I don’t care how you take a man or which man you take and what you do with him. That is your right. That is not my business. My issue is, you are here in a school, where there are impressionable young children and I don’t want the perverted ones, which I know there are, to have an impact on the little ones,” she said. She further argued that being gay is not a disposition that “you were born with” and therefore it was not acceptable. “My issue is, when you turn 18 or 21, you can take a woman, you can take a man, you can take a dog, a goat, a sheep, a cat…I don’t care. You are a grown man and you make grown-man decision. When you are here as a child, it is my obligation to protect you from what is wrong. At the end of the day, I make no pronouncements on people. You do what you want, but do not let what you do, affect the masses.” The teacher said she hates violence and disrespectful students but later threatened to, “rearrange your blasted face”, to any student who disrespects her. She then urged male students to take the good aspects of life with them as they go out into the world as they are the game changers for the society. Contacted yesterday for comment, TT Unified Teachers Association (TTUTA) President Devanand Sinanan said he was aware of the incident but did not want to comment at this time. “Because it is a teacher who may be a member of TTUTA, it will be inappropriate for me to make a comment at this time,” Sinanan told Newsday. In the end days all kinds of morals and standards will have hit our worlds including natural disasters, virus of all kinds, and endless other evils. Perhaps we are getting there. OUR FAITH IS ALL WE WILL HAVE. Jesus said that once you believe in Him you will be subjected to all kinds of persecutions. I am not surprised that the “MISS WANTS A GUN”. Our minds will be tested. WE HAVE TO STOP FOLLOWING THE USA FOR THEY ARE DOOMED ALREADY. An Upper Sixth Form potential scholarship winner of Naparima College, San Fernando, who was involved in a face-off with one of his teachers on the issue of homosexuality, said yesterday that some students verbally abuse him because of his sexual orientation, and his US$500 cell phone was smashed. The young man said he feels threatened. But he added that he is focused on his goal and will not let this obstacle stand in his way. San Fernando police have taken a statement from the science teacher who in an audio clip, which has gone viral on social media, allegedly threatened to shoot the family of the student she branded as gay. THE ANTI-GAY rant by a teacher at Naparima College in San Fernando, resulted in an Upper Sixth Form student being targeted by other students yesterday with verbal and physical abuse and the boy later reporting that his mobile phone was smashed in one of the attacks. The development caused the boy’s father to lament yesterday, “When a student threatens to kill a teacher, he is hauled before the courts. But when a teacher threatens to kill an entire family, nothing is done about it. Where is the justice?” The man’s 18-year-old son has been caught in the middle of a war of words between “straight” and “gay” students at the prestigious Presbyterian-run southern institution. Speaking yesterday, the worried father told Newsday, that his son who he said is “straight”, is now a victim because he stood in defence of his gay friends who were “damned and condemned”, last Thursday, by a teacher during the school’s assembly. It was reported that the following day in a classroom session which was reportedly recorded on tape by a Form Five student, the teacher was heard issuing threats to kill the boy, his parents and his siblings. The matter was reported on Monday to the San Fernando Police Station and a Justice of the Peace. The worried parents in company with a police officer visited the school but were unable to meet with the teacher. The scholarship-winning school is one of five secondary schools run by the Presbyterian church. “My son is not gay for God’s sake and I am really scared for him,” the father told Newsday. “Yesterday (Monday) we met with the Principal and the police and told them of the situation and today (yesterday) someone smashed his phone in school. She (the teacher) has incited violence against him and the other students are reacting.” The father went on to blame the rant of the teacher in the classroom last Friday in which she asked for a gun to deal with homosexuals, among other issues. An audio recording, of which the teacher’s voice was identified as the one using strong and coarse language, is now the subject of a probe by the Ministry of Education following a report submitted by school officials, on Monday. In the recording, the teacher is heard referring to the teenager’s parents as “atheists”, “screw-ups” and persons who do not believe in God and should not be parents. “Give me a gun and I will fix all the problems in the world, both of them (parents) first, then their offspring,” the teacher is heard saying, adding “Don’t tell me there is no God.” The father said he and his wife know “very little” about the teacher. He added: “We are his parents, we are not atheists, for God’s sake. We have never dealt with this woman in our whole life and she has made threats to kill us.” He further explained that last Thursday in assembly it was the teacher who “damned” all gay people saying they are not good. It was his son who went to the front and told the assembly it is okay to be gay. “He is not gay himself,” the father affirmed. “Some of his friends are gay and he found it was wrong for her to target gays. He would always stand up for the rights of other people.” The father said a Form Five student decided to go ahead and tape the teacher because she had been making the rounds to various classrooms discussing the matter as she had been “thrashed” by some of her fellow teachers. The father told Newsday, “The JP and police heard the tapes and are horrified to know that a teacher could blatantly and openly make a comment to threaten and kill me and my whole family and it is being taken lightly by the Presbyterian Board, the school itself and the Ministry of Education. Where is the justice in Trinidad and Tobago?” He asked: “Where is the justice for the children? Somebody could stab my son and they will say they have nothing to do with that. The only time the prestige school will react is when something happens.” Saying he remains scared for his son’s life, the father accused the school of victimizing the teenager and not protecting him. “The school don’t protect anybody because they say they have limited resources but they could raise $250,000 in a bazaar,” the father said. “They have for other things but not to seek the interest of the children, they seek only the interest of the school’s name.” Yesterday, Minister of Education Anthony Garcia said he had nothing to say on the matter. “I am aware of it as I read it in the Newsday but I have no comment, absolutely none at this time,” the Minister said. Chairman of the Presbyterian Secondary Schools Board Robert Ramsahai stated that the board will meet tomorrow with church moderator Reverend Annabelle Lalla- Ramkhelawan and all principals of their secondary schools. Ramsahai however believe the matter has been blown out of proportion and the meeting will properly analyze the issue before making any pronouncements. “I listened to the tape and in my opinion, my only objection is the coarse language. They are senior male students and sometimes you need to wake them up with the kind of language we use sometimes We use it as strategy , sometimes it doesn’t work out well as in this case,” Ramsahai said. Newsday also spoke to Rev Lalla-Ramkhelawan who promised a thorough investigation. “I had a conversation with the Principal yesterday and he has furnished me with some reports concerning the matter and we are going to have a stakeholders’ meeting to discuss the matter, after which we will be in a position to issue a statement,” Rev Lalla Ramkhelewan said. Meanwhile, a senior school official told Newsday the teacher, who is receiving counselling, reported for duty as normal yesterday. The official said, “we cannot be judge jury and executioner. The teacher unknowingly became an activist for gay rights. It is called the law of unintended consequences. Fortunately there is not a lot of gays in TNT or else protesting would have increase at the school. Almost overnight, the simple statement that “it is okay to be gay” has turned the spotlight on a model Naparima College Upper Six student, making him a hero in the eyes of some and a pariah to others. The young man in question, considered an academically gifted student by his peers and teachers, having achieved nine distinctions at the CSEC Level and who hopes to win an island scholarship, has since gone from being on the “A” list to blacklist. However, the young man, who wants to pursue a career in law so he can continue to help the disenfranchised, has sworn not to let this incident shift his focus from his ultimate goals. He told the T&T Guardian when he made the pronouncement in opposition to anti-gay sentiments uttered by a teacher as he spoke at the school’s morning assembly the day before, it was not intended to bring the prestigious institution into disrepute. He said he did not envisage the teacher would have been so affected by his comment that she would have vented before Form Five classes on that and other issues, she having been chastised by her colleagues for her initial remarks. One of the sessions, in which the teacher erroneously dubbed him as being gay, his parents as “screw ups” and “atheists” and threatened to take them and their offsprings out if she had a gun, was recorded (audio) by a student and posted to social media. The post quickly went viral and has been picked up by mainstream media, putting the institution and the teacher under a microscope. 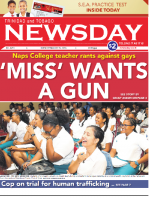 MORE than 600 people have signed a petition in support of the teacher who was heard ranting about shooting atheists and disparaging gays during a classroom session at Naparima College in San Fernando. Up until yesterday afternoon, the petition that is being shared via social media had 610 signatures. The female teacher, who was recorded during a session, remains at the school while an investigation by the Ministry of Education is undergoing. However, she will not attend classes until a decision is taken by the ministry. NOT ONLY was last week’s classroom rant by a teacher at the Naparima College in San Fernando puerile and sanctimonious, but it was grossly reckless conduct which bordered on sedition and the incitement of violence. It was only a few weeks ago that the nation recoiled in shock and horror at a report from a student at the Chaguanas North Secondary School that a gang of students were plotting to use guns to massacre students and teachers. That single report engaged the attention of the highest levels of our nation’s law enforcement authorities, triggered an emergency press conference at the Parliament by Education Minister Anthony Garcia, the suspension, transfer and annexation of over three dozen students, and a national debate about student misbehaviour. No sane or responsible teacher should, in this context, call for the use of guns as a solution to any matter. Yet the unnamed teacher took it upon herself to single out a brave student of Naparima College who – though not gay himself – told an assembly of students that it is okay to be gay. “He has two parents, who should not be parents,” said the teacher later in a classroom. “They are both screw-ups, they are atheists, they do not believe in God. You see me, give me a gun and I will fix all the problems in the world, both of them (parents) first, then their offspring.” We condemn these remarks in the strongest possible terms. They are an incitement to violence and are, furthermore, bigoted and homophobic. While we welcome the fact that the Ministry of Education is dealing with the matter and that the teacher in question has been taken off the class roster, we say a far stronger response is necessary. No person – and certainly no teacher charged with nurturing and educating children – should call for the use of violence as a means of handling differences of belief. Furthermore, no teacher should be allowed to preach homophobic venom to our youth. The boy who stood in front his assembly and, with good nature, called for acceptance can teach this woman a thing or two. He exemplifies the biblical scripture: “Out of the mouth of babes and sucklings thou hast perfected praise.” The responses of Presbyterian Church Moderator Reverend Annabelle Lalla-Ramkhelawan and of the president of the Unified Teachers Association (TTUTA), Devanand Sinanan, have been woefully inadequate. Lalla-Ramkhelawan saw the crass remarks as merely a failed effort at provocation, while Sinanan said he was aware of the incident but did not want to comment. “Because it is a teacher who may be a member of TTUTA, it will be inappropriate for me to make a comment at this time,” he said bafflingly. Who else would TTUTA be called on to comment upon but teachers? Education Minister Anthony Garcia has revealed that he is now in possession of comprehensive reports on the incident and an investigation is now underway. He also alluded to codes of conduct that relate to teachers. It is our hope that once the matter reveals the inappropriateness of the teacher’s behaviour, that the minister’s action will not be as tepid as his initial comments of “no comment.” What aggravates the matter are further reports from the boy’s parents that this is not the first attack by the same woman. Previously, the teacher reportedly has uttered remarks of a vile and violent nature and threatened to harm the child. A proper example must be made of this teacher if we are to protect current and future students at our schools. Whether we agree with the teacher making these comments or not, is not the issue here. Based on religious teachings, ethical standards or the way we view morality is not how this matter is to be judged. It is obvious that the teacher in question was not aware that she is being recorded. This, in itself comes into question as a display of some kind of dishonesty on the part of the person doing the recording without informing her, that she is being recorded. So, if we are looking at wrong doing, there is enough to go around. Homosexuality is not a new subject, not is it an easy one to deal with from the perspective of one who have to administer advice, teach or offer counseling to an individual who is openly gay. To some extent, I feel sorry for the teacher because she speaks for many of us who feel that form of behavior should not be condoned. But we are living in the year 2016. Under the guise of civil rights, that kind of behavior has passed many passages of laws, giving the right to be who they they are. This means that they are legally protected by law, to behave in a way that many of us feel goes against the natural inclination of man to seek a woman and woman to seek a man for cohabitation. This is where the teacher erred in making her opinions known to those outside her sphere of confidence. There is little that can be done about this matter in the workplace, school or public places. Homosexuality is just another lifestyle that we have got to learn to accept, albeit grudgingly. Is Presbyterian Church supporting bigotry? Is the Presbyterian Church supporting bigotry and violence? Speaking on behalf of the family, the student’s mother is calling on police to act decisively on their reports of the teacher’s threats. Last Thursday, officials of the Presbyterian Church and the Presbyterian Secondary Schools’ Board of Education met at the Synod’s Office in San Fernando where they decided that pastoral care would be provided to the teacher and the “victims” and also provide a safe environment for all. Pastoral care is said to be emotional and spiritual support provided to persons in challenging situations. In an audio recording, which went viral on social media, the teacher of the San Fernando college is heard threatening the lives of the student and his family. It was in response to an incident which took place, two Thursdays ago, during the school’s morning assembly in which the teenager went to the front of the assembly and told students it was okay to be gay. This was in response to a prior assembly at which the teacher sermonised against homosexuality. Subsequently, it was learnt the teacher was taken to task by her colleagues for the remarks and she went around to various classes to explain her side of the story. During one classroom session, the teacher asked for a gun to take care of the problems of the world. She promised to shoot the Upper Six student, whom she claimed is gay, along with his parents whom she described in derogatory terms. The boy and his parents have denied he is gay. Initially, the family made reports to the police, lamenting the slow pace of action in comparison to recent arrests of students in other schools charged for threatening violence against teachers and students. In the Naparima College case, the Presbyterian School Board which made the decision was led by chairman Robert Ramsahai and included the church’s moderator Rev Annabelle Lalla Ramkhelawan, officers of the Presbyterian Synod and principals of the five Presbyterian secondary schools. …decision disappointing and told Sunday Newsday no official from the church contacted her family for their views, especially as her son has always been a model student in and out of school.“They have taken this matter very lightly,” she added. “They don’t care about the emotional turmoil of my son, they are only concerned about the teacher who is one of them and although my son is a Naps student, he is not considered part of them. Why are we being treated this way. We have feelings too. She has judged us while not knowing us at all. They have allowed society to judge us also.” She questioned the deafening silence of support groups and other religious bodies in the aftermath of the teacher’s rant. Her family, she told Sunday Newsday continues to hurt. “How can they consider themselves as people of God? Are they saying now that the teacher now has the permission and support of the Presbyterian board to teach such things in addition to the subject which she now teaches?” the mother asks.“You talk about killing people who don’t have the same beliefs as you is that found in the Bible. An official report has been made to the San Fernando Police Station. The Parent Teachers Association is expected to have a meeting on tomorrow with the school’s principal to discuss the matter.” The Ministry of Education is continuing investigations, and Education Minister Anthony Garcia has been reported as saying the Teaching Service Commission is also reviewing the case. The teacher did not attend classes a few days last week, and a petition surfaced last supporting her. A senior official at the school said students and teachers have since moved on. “Exams are going on and the school has settled down already.” While Presbyterian release did not say what were its views on the teacher’s remarks, the church’s moderator has previously commented on homosexuality, saying, in 2015, that gays can be saved. you appear to be a victim of the indian conrolled media on this particular issue. Her speaking out against homosexuality is not a problem! The media is dhaping it to be so but it idn’t or at least SHOULDN’T be…THAT teacher kian, she advocated GENOCIDE! “…just give me a gun and i’ll solve the world problems…i’ll **** him and then i’ll ****…” THAT she shoukd have been FIRED IMMEDIATELY BUTTTTTTTTTTTT her co-ethnics would ‘breaks’ for her…Also Kian, pay close attention…that issue of homosexuality she behaved this way for….is EXACTLY THE SAME mindset that exists against Dark skinned Afrcans…i would love for them to tape her views on THAT!….i doubt you’d pity her then!! Ostracised by his peers, a Naparima College student who recorded the now controversial discussion one of his teachers engaged in with a Form Five class, has again made a recording, this time confessing what he did and apologising to the school and his colleagues. The remorseful young man, in a ten-minute recording he sent to colleagues on What’s App asking for their understanding, said he took full responsibility for recording the violent and homophobic rant of the teacher who also criticised the way her colleagues dressed but he did not take responsibility for making it public. He said his trust was betrayed by a colleague, whom he trusted to listen and give a perspective but who instead posted it online. He said the intention was not to use the information to bring the teacher into disrepute and subject her to all kinds of condemnatory remarks but to engage her in a later conversation as he disagreed with some of the perspectives she offered. He said he had planned to review the recording over the weekend and talk to her on the Monday from a teacher to student perspective. He said he asked him to listen to it and give him a feedback and trusted him to do just that. Calling on his peers to understand where he was coming from and talk to him he said whatever their reaction, he would take it neither negatively or positively but treat them with the respect they deserved. “Come and tell me what going on and we could talk it through. “This is something we need to learn and take something out of. No matter how big or small, no matter good intent or bad intent, you should never ever react impulsively on emotions. Sometimes emotions take over logic,” he said. THE teacher at Naparima College in San Fernando whose homophobic classroom rant went viral on social media last term and created a controversy has not returned to the school to take up duties. The Express was told she has not shown up for duties since school re-opened on Monday. She is being investigated by the Teaching Service Commission (TSC). Last month, the teacher, with over six years’ service at the all-boys school, was recorded talking about killing atheists and gays while before a class of Sixth Form pupils. She went on three days medical leave shortly after. Upon returning to work, the Express learnt she was on the school’s compound but not teaching classes. More than 600 people had signed a petition in support of the teacher. The Presbyterian Church had launched an investigation along with the Ministry of Education and a final decision concerning the teacher is expected to be made by the TSC. The Equal Opportunity Commission (EOC) issued the following statement on the matter yesterday: “The Equal Opportunity Commission (EOC) has noted reports that were carried in print and electronic media (including social media), of statements allegedly made by a teacher to a class of students at a secondary school. Some of these statements as reported, may amount to offensive behaviour as defined by section 7 of the Equal Opportunity Act Chapter 22:03 (the Act). “It was reported that the teacher, in the course of a discussion on issues of religion, including atheism and homosexuality, suggested that certain “issues” could be “fixed” by the use of a gun. The EOC notes that the nature and tone of such comments may possibly incite gender and/or religious hatred. “Statements or actions are considered to be offensive behaviour under Section 7 of the Act where they are done otherwise than in private, and the statements or actions are such that: they are reasonably likely, in all of the circumstances, to offend, insult, humiliate or intimidate another person or group of persons; they are done because of the gender or race or ethnicity or origin or religion of the other person of some or all of the persons in the group and they are done with the intention of inciting gender or racial or religious hatred.